Mangifera indica or Mango is a very popular fruit in India and all parts of the world. It is famous for its bright yellow color and exquisite taste. The most popular variety of Indian mango is the "Alphonso".It is a crop of great economic importance to India and is cultivated in many parts of the country. Please note that the above slideshow is automatically created by searching Flickr and does not contain manually curated images. Hence, it is likely that some images may not be exactly of Mangifera indica. 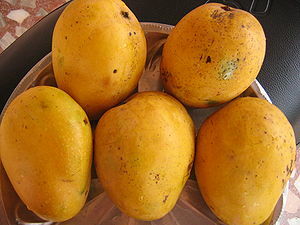 The word Mango is supposedly derived from the Malayalam word Mangga, through the Portuguese word Manga. Mango has been cultivated for several centuries in South-East Asia. The species appears to have been domesticated about 4,000 years ago. 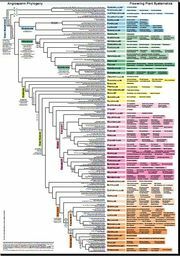 The species was first moved around 400-500 BC from northeastern India to east Asia; next, in the 15th century to the Philippines; and then, in the 16th century to Africa and Brazil by the Portuguese.The species was described for science by Linnaeus in 1753. Organ-specific disorders The twigs and leaves, used to clean the teeth, are said to be beneficial to the gums, while the bark is said to be useful for toothaches. The astringent stomachic bark is also used for internal hemorrhages, bronchitis, and catarrh. The resin is used for cracked feet, ringworm, and other fungi, syphilis, and to induce sweating. Smoke from the burning leaves is believed to cure various throat disorders, from asthma to hiccups. Dried mango flowers, containing 15% tannin, serve as astringents in cases of diarrhea, chronic dysentery, catarrh of the bladder and chronic urethritis resulting from gonorrhea. Green fruits are considered anticholeric (baked and mixed with sugar and taken internally and also rubbed over the body), antidysmenorrheic, antiscorbutic, astringent, and diaphoretic. Roasted green fruits are dissolved in sugar water and taken internally to prevent sunstroke. Ripe fruits are considered diuretic, laxative, and unguent. A gruel made of the seeds is taken internally for bleeding piles. The wood is favored for making shovels. 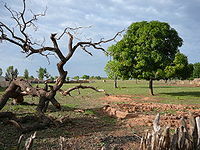 The bark contains mangiferine and is astringent and employed against rheumatism and diphtheria in India. The resinous gum from the trunk is applied on cracks in the skin of the feet and on scabies, and is believed helpful in cases of syphilis. Mango kernel decoction and powder (not tannin-free) are used as vermifuges and as astringents in diarrhea, hemorrhages and bleeding hemorrhoids. The fat is administered in cases of stomatitis. Extracts of unripe fruits and of bark, stems and leaves have shown antibiotic activity. In some of the islands of the Caribbean, the leaf decoction is taken as a remedy for diarrhea, fever, chest complaints, diabetes, hypertension and other ills. A combined decoction of mango and other leaves is taken after childbirth. The twigs and leaves, used to clean the teeth, are said to be beneficial to the gums, while the bark is said to be useful for toothaches. The astringent stomachic bark is also used for internal hemorrhages, bronchitis, and catarrh. This page was last modified on 20 November 2010, at 16:33.